Kevin Armstrong, the senior pastor at North UMC in Indianapolis, asked the staff to read an article that appeared in The New Yorker in May. It is actually the commencement address delivered to Harvard Medical School's 2011 graduating class by Atul Gawande, and it is called "Cowboys and Pit Crews." The staff is slotted to discuss the article and its implications for the pastoral team at today's staff meeting, but I actually won't be there, so this is my reflection on the article. Gawande's speech is focused on the medical world and has lots of implications for health care policy and even education, but I'm going to set all that aside for now. His basic point is that doctors for a long time were expected to be able to hold all the information and skills necessary to practice medicine independently—and before modern medicine developed and ballooned into what it is now, they were able to do that. Unfortunately, Gawande says, the idea that a doctor should be a cowboy and work autonomously is destructive in a system that now requires more and more specialization. An individual doctor is able to practice medicine in a much narrower sense than was one possible, but he or she is still expected to function independently—hence the ongoing problems with misdiagnosis, the high rate of infections contracted within hospitals, redundant testing and treatment, etc. Gawande argues that doctors need to be able to work more collaboratively, because as each doctor becomes more focused in his or her specialization, he or she needs even more the expertise of other professionals. Gawande advocates the cultivation of three main values: humility, discipline and teamwork. He points out that these values are "the opposite of autonomy, independency, self-sufficiency," mores that we prize and of which we are reluctant to let go, having been so indoctrinated in them. We do not need doctors who can work independently, Gawande says; we need pit crews, not cowboys. I am glad to know that the staff at North is starting a conversation about this particularly on the teamwork front. One thing I have loved about working here is that the leadership is very much hands-off. I always tell people that when it comes to working, I need direction but not a lot of supervision. I do not respond well to micro-managing, so the atmosphere at North is a great fit. They bring in people who are gifted at what they do, and they trust them to do their thing without excessive hand-holding. It is a very empowering approach, and Kevin (along with the rest of the pastoral team) is always available to respond to questions or concerns. However, one thing the church is realizing is that there are a lot of incredible ministries going on here, all of which are great in their own right, but which would benefit from improved communication and collaboration with other things happening in the church and the community. People involved in outreach may not have the slightest clue of what's going on with the children's ministry, and that is true both of parishioners and pastors. It's not surprising in a church of North's size with the number of amazing ministries it has, but since I've been here, I've heard a number of conversations that reveal a common desire to work together more. It seems to me that there is a balance to be struck between micro-management and fragmentation, but when that balance is found, good things will happen. 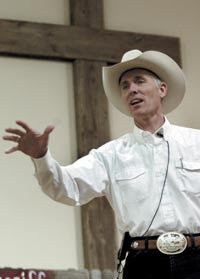 This has nothing to do with anything, but in googling "cowboy preacher" to find a picture for this post, I found the website of The Reverend Lon M. Burns, D.D., M.S.W., "America's Favorite Jewish Cowboy Minister." What? !